En dan kom je op de Live Chat helpdesk: 'MobileMe Advisors are available to assist you. Chat now!' En wat blijkt? Na de eerste standaardantwoorden komt mijn Advisor Devin ECHT aan het woord, en tot leven. Het is geen geautomatiseerde assistent, zoals de paperclip of het hondje van Microsoft. Nee, het is een echt mens, van Apple. 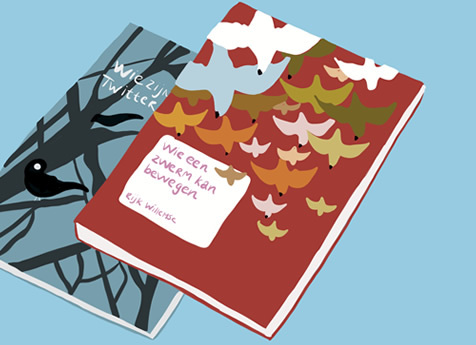 Geweldig. En een excellent voorbeeld van webcare. Hi, my name is Devin. It'll be just a moment while I review the comments you provided. Hello, Rijk. 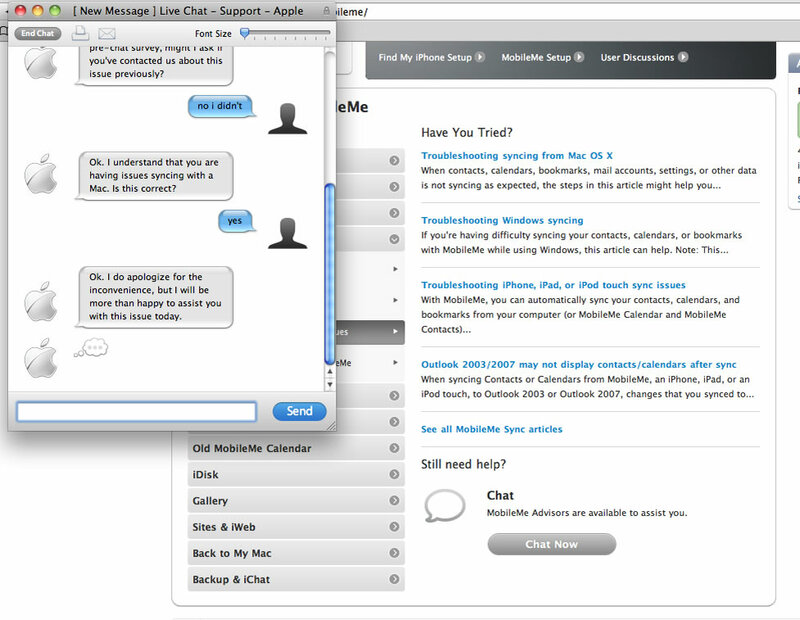 Thank you for contacting MobileMe chat support. I look forward to giving you excellent support today. While I'm reading your pre-chat survey, might I ask if you've contacted us about this issue previously? Ok. I understand that you are having issues syncing with a Mac. Is this correct? Ok. I do apologize for the inconvenience, but I will be more than happy to assist you with this issue today. Are you signed in under System Preferences? Ok. Is all the information on the cloud? Ok. Can you go to MobileMe in System Preferences please? And go to the Sync Tab. Are all the boxes that you want to be checked, checked? Ok. Is it just iCal that is acting funny? Ok. Can you click the Advanced tab at the bottom right. But make sure the Orange Arrow goes from the Cloud to the Computer. Let me know when that sync is done. 'HTTP/1.1 403 Forbidden'op de bewerking 'CalDAVAccountRefreshQueueableOperation'. ignored this - should I synch again? Are you using the new or old Calendars? help me... what's old and what's new? Go to the Calendar application. That is the reason why it will not sync correctly. does this only apply to my computer? My iPhone doesn't have os4 running, I think - will it drop out? I'll manage on my own and report back, ok? Thanks for chatting with us. We value your feedback. Please click the "End Chat" button at the top left corner of the chat window and answer a few questions about your experience with us today. Are the Calendars on your iCal? Ok. Are the calendars under the section '"On My Mac" or Under you Username? In iCal. On the left side. Ok. Everything has to be under your username in order for it to sync. Ok... you mean i have to delete the 'on my mac' calandars'? Yes. But add them to your username first so they will no be lost. How to add them to my username? You have to export them to the desktop and import them back in but under your username. File > Export > Export..
Then File > Import > Import.. But, since they have the same content, I can delete the 'on my mac' calendars instead? Yes, if they are the same. Just make sure everything you want is on your username though. It works perfectly ! Thanks and c.u.